What sort of crime did Meriam Yehya Ibrahim commit for the Sudanese government in Khartoum to imprison her while pregnant, sentence her to 100 lashes and death by hanging, and in an unexpected twist re-arrest her a day after she was freed? 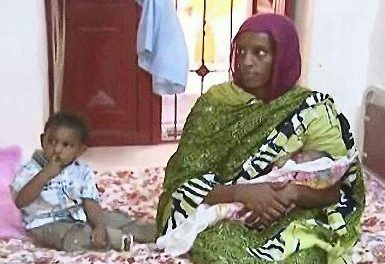 Meriam is a 27-year old Sudanese woman who had been imprisoned in Omdurman Women’s Prison in Sudan’s capital city, Khartoum, since January along with her 20-month old son, Martin, and gave birth on May 27th to her baby girl, Maya, while still in prison. There are reports that she was forced to give birth with her feet still shackled. Her sentence was expected to be carried out after she had nursed her baby girl for two years. The “crime” for which Meriam was put on death row is simple: she married a Christian man and refused to renounce her Christian faith. The court in Sudan reportedly gave her three days to recant her Christian faith and “return to Islam” but she refused and was convicted of adultery (for marrying Daniel Wani, a South Sudanese-American Christian) and apostasy. The legal suit against her was filed by a man claiming to be her brother, who upon hearing of her release told CNN that “the law has failed to uphold our rights. This is now an issue of honor. The Christians have tarnished our honor, and we will know how to avenge it.” According to Sudan’s version of Sharia law, Meriam is considered a Muslim because Islam was the religion of her father. However, she was not raised a Muslim, as her father left the family when Ibrahim was six years old. She was raised a Christian by her Ethiopian Orthodox mother. On June 24th, 2014, a day after she was released from prison by Sudanese authorities, Meriam was rearrested at the airport in Khartoum as she, her husband, and two children were trying to leave the country. She was reportedly detained and questioned at the airport and was later taken to a police station over questions about her travel documents. As of now, she is still in custody and it is unclear whether she will be able to leave Sudan or if she will be re-released. The international community stands in solidarity with the Ibrahim family and unambiguously condemns the violation of the basic human rights of Meriam Ibrahim, her family, and those of others whose stories have not been told. Religious freedom is a basic human right that all people are entitled to. Consequently, Meriam should be released from Sudanese custody immediately.